Let’s get creative and build something! Lift and lug, heave and haul – with a little creativity, you can do it all! 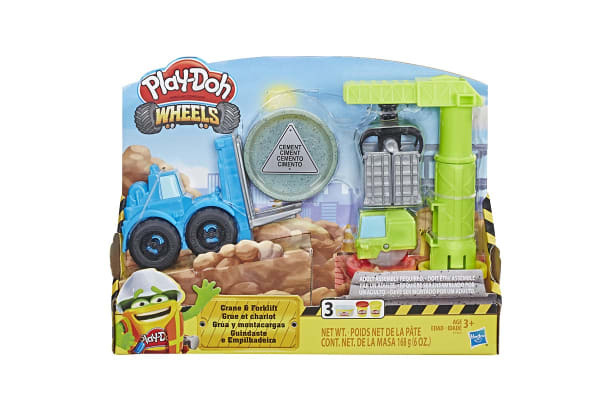 Imagine your own Play-Doh construction site with the Play-Doh Wheels Crane and Forklift. The Play-Doh Wheels Crane and Forklift set builds imaginations and makes silly cement bricks, slabs, beams and other building materials using the Play-Doh Cement Buildin’ Compound. It’s the same non-toxic Play-Doh compound we all know and love, except with glittery specks mixed in to look like cement!